Born on October 23, 1942 in Montreal, Louis Desjardins always had racing in his blood. At 16-years-old, he was racing go-karts and winning championships. At 18-years-old, he watched races at an aviation launch pad in Longueuil, the birthplace of drag racing in Quebec. In 1967, he bought his first car—an 1949 Oldsmobile purchased for $600 in Albany New York—and began racing in Napierville. In 1972, Louis Desjardins won the Grand Molson National with a 1969 Chevrolet in SS/PA. He was the first Quebecer to win Nationals for the NHRA. In 1974, he was the runner-up in SS/LA among 1,300 cars at the U.S. Nationals in Indianapolis with his 1969 Camaro. He won a total of nine trophies with this car. In 1988, he finished fifth in the world in all around points with his 1982 Firebird, setting the record for his class SS/GTC. 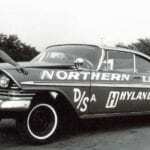 In the same year, he won the Points Meet in Englishtown New Jersey, one of the toughest places to race. Louis Desjardins sold his car and retired from racing in 1999. 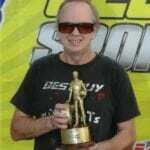 He is still very involved in drag racing, frequently going to races and spending time with his friends in the industry.